Palm trees are very common in tropical and sub-tropical climates. Although they are often associated with sandy ocean beaches, and often grow in these conditions, coconut palms grow well in many other locations and are very popular as ornamental trees in many urban locations. However, when growing coconut palms in urban areas, be sure to prune the flowers and fruit before they fall. 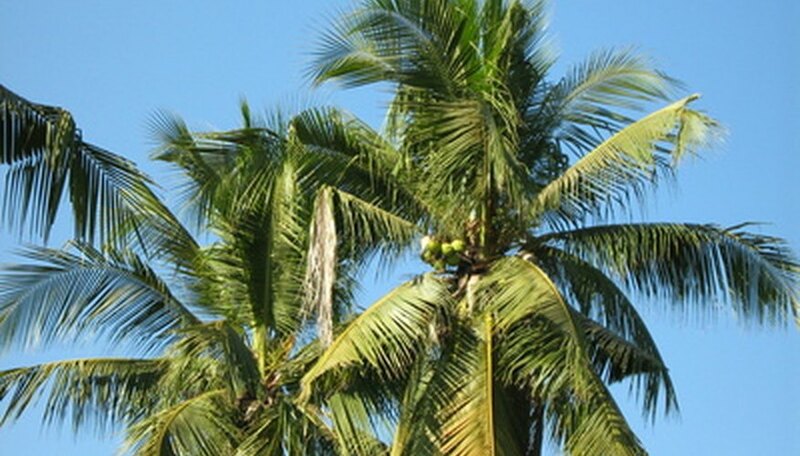 Falling coconuts can cause injuries. The Jamaican Tall is a tall, fast-growing cultivar that that has a swollen trunk base and a crook as the tree rises. Jamaican Tall coconut palms can reach between 80 and 100 feet in height. Most palm trees grow in very similar soils. Coconuts grow in sandy soils that drain very well. They can tolerate brackish soils and salt spray, but don't require salt when grown inland. Coconut palms, however, grow in most types of soil that drain well. Soil pH for coconut palms generally must fall between 5.0 and 8.0. They require a lot of water, doing best in places with annual rainfall of between at least 30 and 50 inches. Annual temperatures for areas where coconut palms grow need to be around 72 degrees F. Coconut palms are harmed by any temperatures below freezing. The Malayan Dwarf is actually a semi-dwarf tree. Its height ranges from 30 to 60 feet. Malayan Dwarfs have don't have the bulge at the base of the trunk like Jamaican Talls, but have a similar crook near the base. Malayan Dwarfs grow in most soil types, as long as they drain well. It is tolerant of drought, but does best with adequate water. Like other palm trees, the Malayan Dwarf is tolerant of salty soils and salt sprays. The Malayan Dwarf, like all other coconut palms, requires full sun. The Fiji Dwarf is a true dwarf coconut, with many trees growing to a maximum of 15 to 25 feet tall. Fiji dwarfs grow in similar soils and conditions to other coconut palms. Although they are often associated with, and found in, sandy soils near the ocean, their main requirement is for a soil that drains well. The Fiji Dwarf has a short trunk that, in some cases, is between 1/3 and 1/2 of the overall tree's height. The tree's fronds make up the rest of the height. Fiji Dwarfs require the same temperatures as other coconut palms and don't do well in places where average annual temperatures drop below 72 degrees F.